Last year I was at home with my kids full time. Leo was about to turn 5 months and we had recovered from a hectic start since Leo had baby colic. Our everyday life was becoming somewhat normal and we were adjusting to our new family. 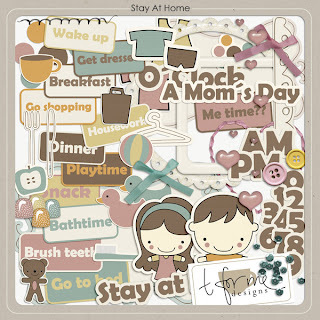 The perfect kit to scrap those moments at home with the kids is Stay At Home from T for me Designs. It's a bright and happy kit with smooth baby colours and perfect elements. I've used a template from T for me, called Rounded Corners Edition. Go get it now! If you are fast and shop before December 16th you have the chance to win a gift card woth $5 at T for me.